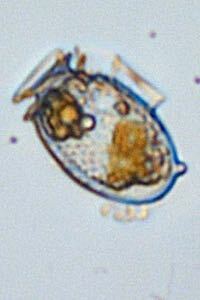 Dinophysis is one genera responsible for Diarrhetic shellfish poisoning (DSP), a global illness with incidences of outbreak or high toxicity occurring in North America, western Europe, east and southeast Asia, South America, Latin America, South Africa, New Zealand, and Australia. Dinophysis is considered an emerging bloom species in the U.S., with the first reported closure of a shellfish harvest recorded off the coast of Texas in 2008, and subsequent closures off the coast of Washington and New York State. The distribution and timing of Dinophysis blooms in Chesapeake Bay is poorly known, with sightings observed in May and June under generally moderate salinities of 20-24 parts per thousand. More research is needed to fully understand bloom dynamics and their effects in the Bay and mid-Atlantic region. Potentially toxic species identified in the Chesapeake include Dinophysis acuminata, D. acuta, D. fortii, D. caudata and D. norvegica. Okadaic acid and dinophysistoxins, produced by Dinophysis spp., can accumulate in filter-feeders, such as bivalve shellfish, and adversely affect human health and marine life. The resulting syndrome, diarrhetic shellfish poisoning (DSP), results in such symptoms as diarrhea, nausea, vomiting, and abdominal pain, likely causing sub-acute exposures to be mistaken with other forms of food poisoning. The toxicity and potential impacts of local strains of Dinophysis to marine life and human health remain largely unknown in our region, but are currently under investigation. A thecated (i.e. “armored”) dinoflagellate that relies on light and prey (mixotrophy) for bloom formation and toxin production. Feeding occurs through a peduncle that extends from the dinoflagellate into the prey, allowing the predator to extract plastids it can later use for its own photosynthesis, growth, and toxin production. More research is needed to fully characterize bloom dynamics, with special focus on the apparent dependence of Dinophysis blooms on an earlier peak in prey populations. VIMS researchers are conducting experiments aimed at understanding the potential toxicity of local strains of Dinophysis spp. This work involves efforts to quantify DSP toxins in shellfish and other marine organisms and to conduct bioassays to determine toxicity to local biota. Of special interest is the ecology of Dinophysis blooms in Chesapeake Bay, including life stages, phylogeny, toxin production, allelopathy, and toxicity as assessed with bioassays.